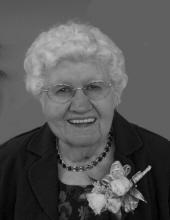 Barbara Mae Bryant (nee Swegle), 97, went to be with her Lord Jesus on 1/14/2019. She was born 10/7/1921 to Walter and Erma Swegle of Osakis, Minnesota. She lived in WI and IL before moving into Wittenberg Village Assisted Living in Crown Point, IN. On July 21, 1957, she married Gerald Bryant of Scottsburg, IN, and they were married 54 years before his death in 2011. Barbara was always an active member of her church, serving as Sunday school teacher, choir member, and in many other ways. A very good cook, she also worked at the Lake Zurich High School cafeteria for several years. Barbara is preceded in death by her parents Walter and Erma Swegle, her husband Gerald Bryant, brothers Dale (Dorothy) Swegle, Warren Swegle, Darrell (Joanne) Swegle; and son-in-law Bob Summerell. Barbara is survived by her four children, LaVerne (Susan) Brancamp; Karen Summerell; Paul (Janet) Brancamp; and Maurice (Jeanette) Brancamp; sister Margaret VanderLinden; and sister-in-law Marion Swegle. A memorial service will be held at a future date to celebrate her life, and private burial will be in the Wauconda Cemetery next to Gerald. To send flowers or a remembrance gift to the family of Barbara M. Bryant, please visit our Tribute Store. "Email Address" would like to share the life celebration of Barbara M. Bryant. Click on the "link" to go to share a favorite memory or leave a condolence message for the family.